The jigsaw—also called a saber saw—is a versatile performer in the shop and on the jobsitc. 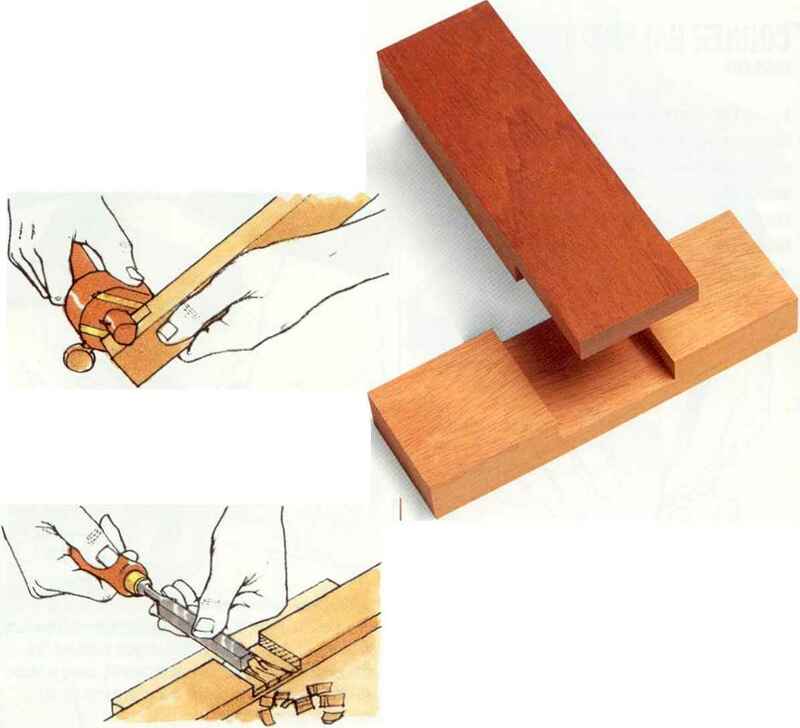 It cuts curves and irregular shapes in solid wood and sheet goods. It can make cutouts in the middle of a board and scribe cabinet sides to make them conform to wall contours. Fitted with different blades, it'll also cut metal, plastic, and other materials. For this shop test, we picked out 17 top-of-the-line models from 11 different manufacturers. Priced between $100 and $500, these saws offer levels of control, power, precision, comfort, convenience, and durability that you won't find in low-end versions. Top Handle or Barrel Grip? 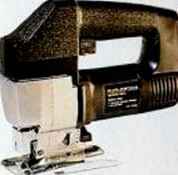 Manufacturers make jigsaws in two different grip styles: top handle and barrel grip. Of the jigsaws we tested, the Craftsman and Freud models come with top handles only; the Fein, Festo, and Metabo come with barrel grip only. The six other brands offer a choice between the two for the same price. Which style is better? Among experienced woodworkers, you'll find passionate advocates on both sides of the handle vs. barrel debate. In the U.S., top-handle jigsaws outsell barrel grips by a very wide margin, but in Europe it's the other way around. Most of our testers prefer the top handle for two reasons. First, when you grip the top handle, your index finger and thumb are almost directly over the blade. We found that this gives you better control on curved cuts. Second, during long periods of cutting curves, the barrel grip tired out the wrist and forearm more quickly. We tested and rated each model in five categories: power, blade-changing convenience, cutline visibility, baseplate quality, and ergonomics. Using high-quality Lenox jigsaw blades, we made straight, curved, and beveled cuts in solid.wood, plywood, and particleboard. You'll find our ratings, with other important test results, in the chart on pages 66-67. Power. All the models in our test had plenty of power to cut through all kinds of wood, including 5/4 hard maple. 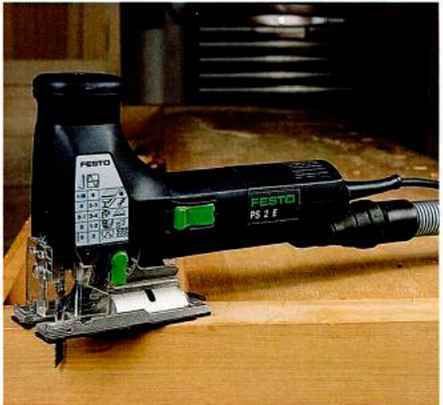 The Fein has the lowest amperage rating (and lowest maximum speed) in our test group, and it cut a bit slower than the other models, but we still found its Text continued on page 68. 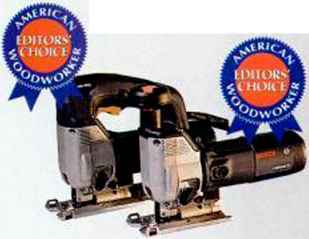 Metabo's quick-release lever makes blade changes effortless (right). 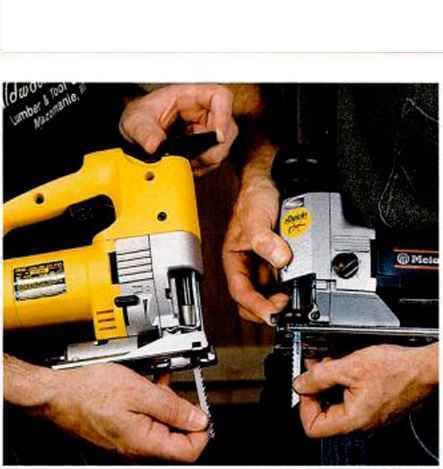 DeWalt requires a few turns of a pull-out knob (left). Dust collection on most saws works well only if you attach a clear plastic blade shield. Festo's shield allows good visibility. Some shields cloud up with dust and obscure the cutline. On some saws, left-handers can inadvertently press the lock-on button, creating potential danger—you think you're turning the saw oft' but it keeps going. CONS: Lock-on button potentially dangerous tor lefties (top handle only). CONS: Lock-on switch difficult to operate; resetting base to 90' is fussy; no dust-collection port. 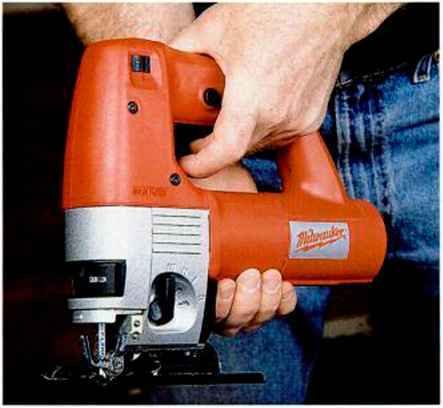 PROS: Toolless blade change and base adjustment; soft-start motor (barrel grip only). CONS On/off switch uncomfortable on barrel-grip model; lock-on button difficult to use on top-handle model; 90° base detent imprecise; no dust-collection port.